I'm a little curious. What is a "Draperclothier"? Does anyone know? It's two words, draper clothiers. Draper is an old/obsolete word meaning "Latest" "in Style" "sharp" usually associate with finer man's cloths. The term was still used in depression times. On Weathering; Just take it slow. I've been modeling since 1970 and I'm just STARTING "to get" it (I think). One of the problems is that there are so many different approaches to it, it's hard to make choices. 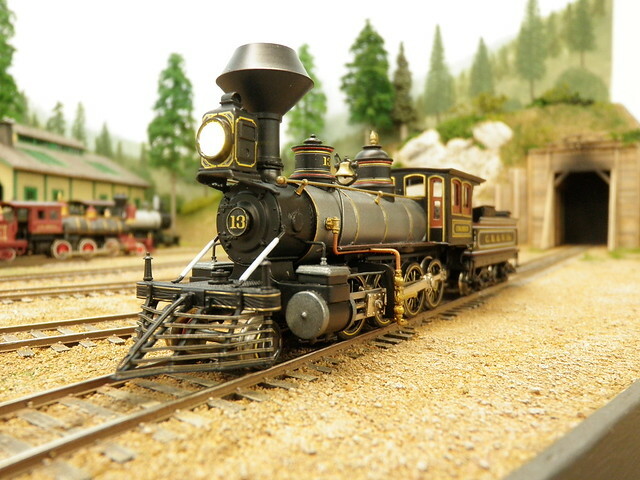 One of my pet peeves is that modelers want to model everything the same. It's ether all skid row or all new built. That's just not life. Even when a town did spring up overnight (as in case of a new railroad town) the individual builder's economic advantage or disadvantage (or just his attitude) would effect his build and it's finishing. In a short time the owner's diligence to maintenance was soon evident. You do find shacks next to palaces. Only later when these developments become "proper" cities do Zoning laws take out the extremes in neighborhoods. Ops, I've gotten a bit off theme here; getting back; Try little steps at a time. I've learned, A&I staining of the Kit's wood parts ALWAYS improves the model (unless you're doing a "building under construction"). Even if your going to paint it. I really like Troel's methods on coloring on buildings that are "supporting actors". The stars get more traditional approach. 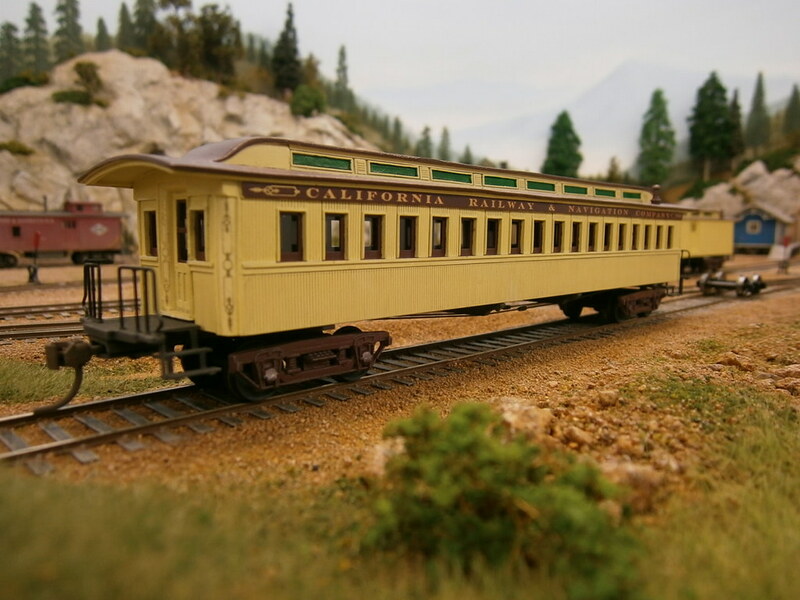 Any railroad property get's less weathering because image is important to the owner. He feels a clean, maintained image carries the thought of care. Care (or respect) that will also be shown to him as a passenger or to any freight that he might ship on the railroad. I've digressed again; The main point point I'm trying to make is; Take it slow, develop the approach YOU like. Go light with the weathering at first. You can always go back and add more but clean up is much more involved. Can I see more of your Westwoods? It has a nice ring to it. Thank you for the explanation. My first thought was a specialist putting up curtains:-). Thank you also for your interesting thoughts on weathering. They will come in use in the future. We are away over the weekend. I take some photos of the Westwood cars as soon as I can when we come home. Just catching up on this thread - well done! Bob, we are now back home. Here are some photos of the Westwood cars. See below. The straw yellow ones are made as per the kit with the exeption that I replaced the wood parts with styrene as it was easier to join. 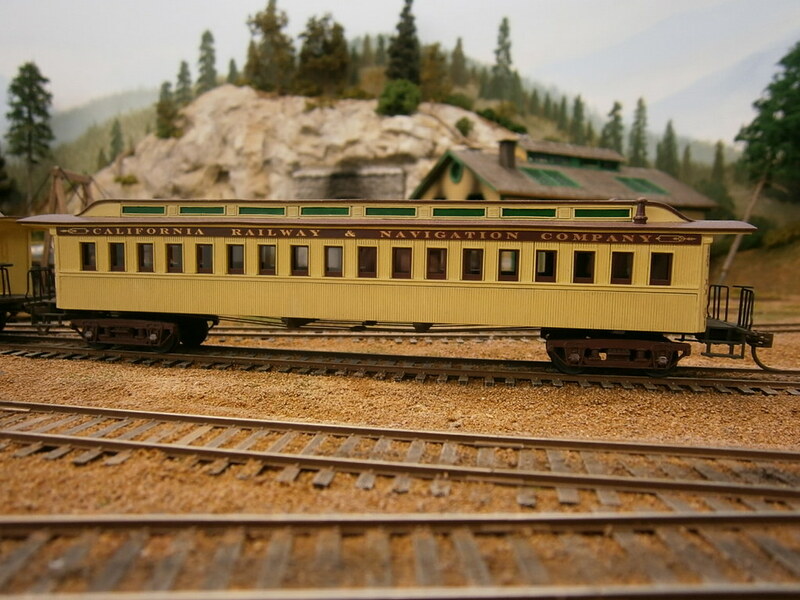 Both these cars are from the CP Golden Spike set. The one in the terrible green color(I don't know what I thought when I chose the color ) I bought half built. 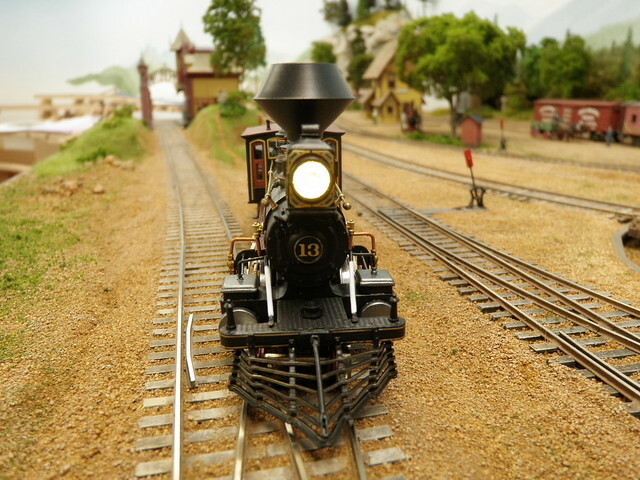 It is from the UP Golden Spike set. It is as from the kit with wooden parts and styrene parts mixed. With the little more knowledge I now have I will make some more modifications and updates to the cars concerning clerestory windows and ventilation. 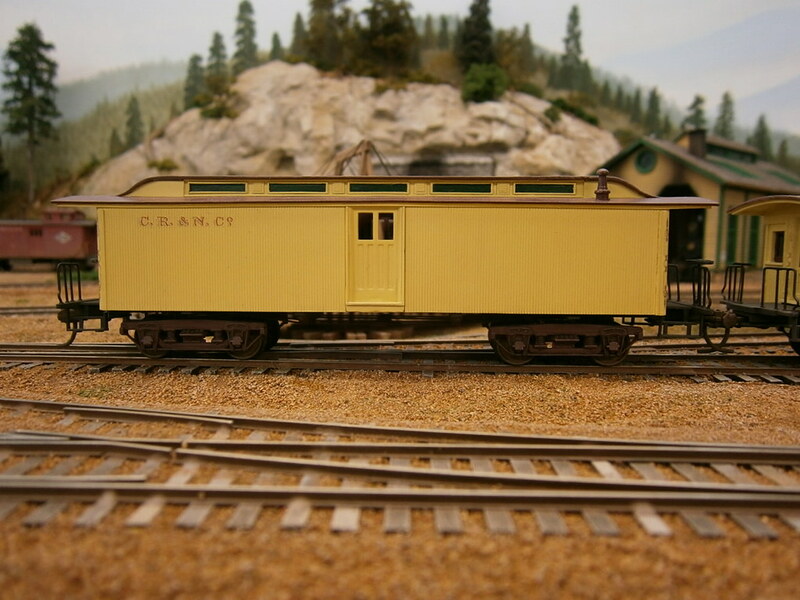 The trucks on the cars are from Bitter Creek Models. I have bought the Buckboard set and when it arrives I'll see if I can put it together with my rudimentary soldering skills. Thank you H�kan. The Westwoods look really good. The cars that you replaced the siding with styrene look really good to me. I agree with your assessment of the green color too. Are the corner decals custom made? 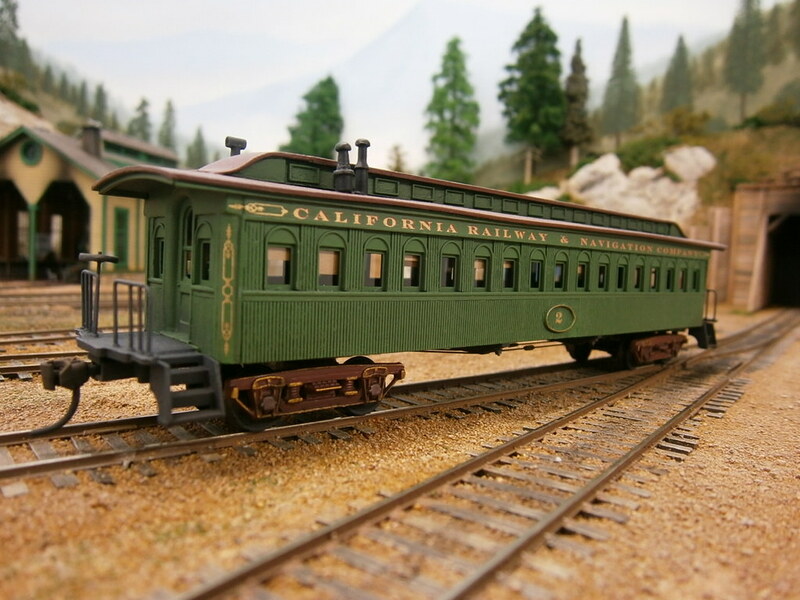 On the Micron Art wagons; I wouldn't try and solder them but would use ACC (super glue). all the decals are custom made by myself using a school version of Coreldraw. About the green, I looked for something lighter then Pullman Green but I don't know why I chose just that color. Anyhow it looks hideous. It will be brought back to the paintshop. I'll see when the kit arrives. I'm tempted to try solder as I recently joined a local group whose main goal is to solder together etched brass kits. We meet two times a month and sit together gossiping, drinking coffee and hopefully also do some soldering . Great fun! And then printed them on your inkjet? On White or on clear decal paper? I think we're all guilty of making bad color choices one-in-awhile. I know I'm not inocent there. It sounds like a fun group to be a part of. Thanks H�kan. That's a different approach. I asked 'cause I have difficulty printing light color decals that are dense enough to use on dark color backgrounds. Micron Art is great stuff. I think the green look fine set off with the gold decals. here on the Early Rail thread it is awfully quiet right now in middle of the summer . My railroad has just received a new brute. 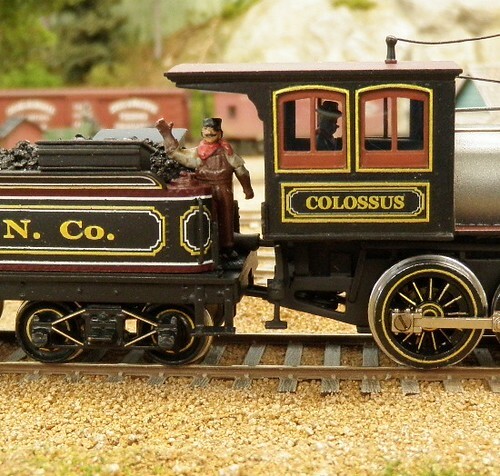 No 13 appropriately named the "Colossus". The one-eyed engineer waving is happy for the new assignment and hopefully soon will be testing the locomotive on the stiff grades up from Innsmouth. 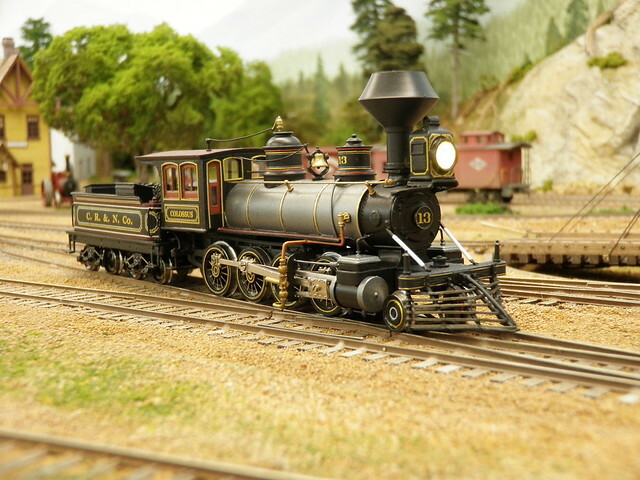 The model is a Empire Midland PRR H1 2-8-0 import which I have painted in a Pennsylvania RR livery from the mid-70s. I received a lot of help with the livery from a very helpful Aussie so hopefully apart from the name and road name it is somewhat accurate. 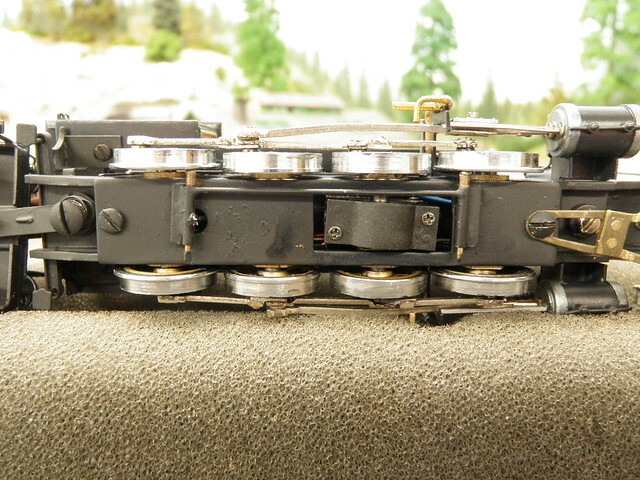 It has also received a new motor and gearbox along with a ESU sound decoder. I applied Greg Rs excellent power pickup to it which works great (Thanks Greg!). 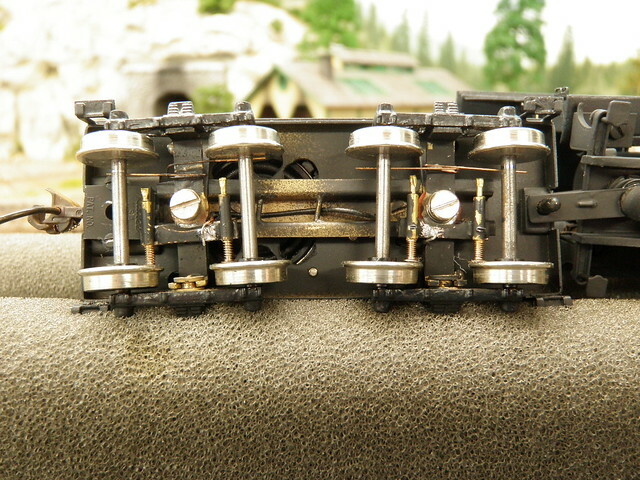 The locomotive mechanism has given me a lot of headache though . When I received it it could not run at all due to a severe hitch in the mechanism. It came down to that the drivers was not quartered to each other. There were also other problems but the main problem was the quartering. After a lot of tinkering it now runs quite good in forward and with a little hesitation at every rotation going backwards. This tinkering probably gave me lot of grey hairs and tested my patience to the limit. If I had tinkered with it some more I probably would have ended up in a asylum with restraints . So for the sake of my mental health I concluded that it�s running capabilities was good enough. You've track done a H1! That's so cool. You got her looking good too. I've heard they're a mechanical challenge. Glad you tamed the shrew. Nice way of power pick-up...Hmmmmmm would this work for the small 0-4-0..